The oldest and most historic pub in Fulham with, according to rumour, a tunnel leading to the Bishops' Palace. I believe this to be untrue. 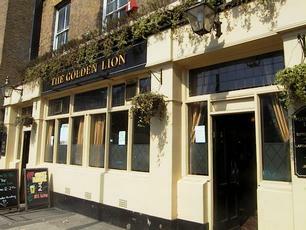 My review from nearly 12 years ago says "Very much a locals' pub, unchanged for several decades, whether this is good or bad depends on your viewpoint. Fullers Pride £2 a pint." I don't know about the Pride but I suspect if there was any it would be a lot dearer than that. Unfortunately there did not seem to be any and it looked like some of the locals have been propping up the bar since the days the tunnel was dug. Assuming it existed which I don't think it does. was there last night and my friend ordered a carling and epa - then changed his mind and went for kronenberg and epa - the barmaid poured a carling and kronenberg. Once my friend pointed this out she had a go at him, then the locals started to get involved and was going 'go on girl' complete waste of a pub. Went here last Saturday. Good old fashioned pub, if a bit rough around the edges. The pint of Pride I had was spot on. A complete contrast to some of the pompous pubs/client�le on the other side of the river. rProper 'match day' pub....decent mix of locals,away fans,office workers and the like. L.Pride not of the best quality,but saving grace is the large garden....seems to treble the size of the place. Outside bar and grill a nice touch for avoiding the melee inside...burgers ok for �2,just a pity it's such a larger driven pub...! A proper pub. Proper people (ie, not beautiful/cool people) drink here and you can have a beer and a yarn with anyone. Nice beer garden. I havn't been late in the evening so can't comment on the suggestion that the beautiful/cool people come here later.